My parents are visiting this week (on the California leg of my Dad’s book tour) — and that means I am experimenting with recipes I wouldn’t make for just the four of us. My parents (unlike my children) are eager and adventurous eaters, and while the food here ultimately matters less to them, I think, than the company (grandchildren! ), they’re happy to eat just about whatever Tony or I feels like cooking. They like to cook, but I know it’s a nice break for them to be catered to; they have a great store of homegrown produce in their root cellar and freezer, but I know that what looked like an appealing bounty in August can start to feel a tiresome burden in October. Because everyone, not just the parents of young and picky eaters, gets into food ruts. Whatever breaks you out of a routine — houseguests, the change in seasons, a new recipe — is a blessing. Right now, we’ve got all three working for us, and I’m grateful. 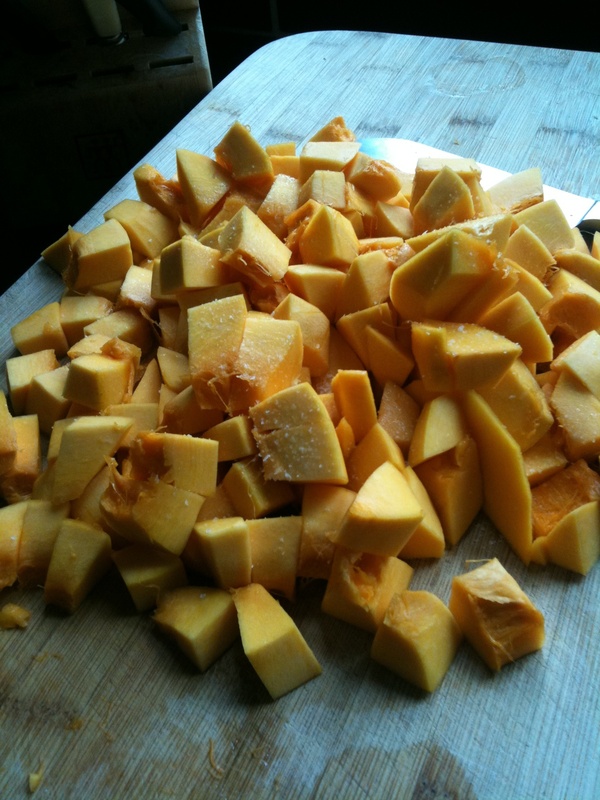 I spotted this curry recipe a couple weeks ago, just before the first pumpkin arrived in our CSA, and have been saving it for my parents, though it’s a mild enough curry that your kids may like it, too (mine tasted it, and then ate rice with plain tofu). I’ve linked to the original and will paste in the recipe as I made it. 1. Sprinkle pumpkin chunks with 1/2 tsp. salt. Heat 1 tbsp. oil in a large nonstick frying pan over medium-high heat. Brown half the pumpkin in oil, turning once, 6 to 8 minutes; reduce heat if pumpkin starts getting dark. Transfer to a bowl and repeat with 1 tbsp. oil and remaining pumpkin. Set all the pumpkin aside in a bowl. 2. Meanwhile, heat remaining 1 tbsp. oil in another large frying pan over medium heat. Cook onion, stirring occasionally, until deep golden, 12 to 15 minutes. Transfer half to the pumpkin- frying pan and reserve other half in a bowl. 3. Add chiles, cinnamon, and curry leaves to onion in pan. Cook, stirring often, until curry leaves are very fragrant, about 2 minutes. Add turmeric, cumin, and remaining 1/2 tsp. salt and cook, stirring, until spices are fragrant, about 1 minute. 4. 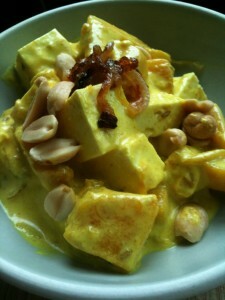 Return pumpkin to the pan with the onion and spices and add the coconut milk and tofu. Bring to a boil over high heat, then cover, reduce heat, and simmer until pumpkin is tender, 5 to 10 minutes. Stir in lemon or lime juice, and add more salt to taste. Top curry with nuts and reserved onion and serve over rice. Mm, looks good! I made a potato/chickpea/kale curry last night that was also tasty (also with coconut milk) and now I want to make curry every night. But Nick would be sad.